I t’s official. On January 25, the Doomsday Clock ticked forward 30 seconds to rest at 2 minutes to midnight. That means we are closer now to thermonuclear war than at any time since the Cold War, according to the Bulletin of Atomic Scientists. And with President Trump having mused aloud “if we have nuclear weapons, why can’t we use them,” the threat of all out nuclear war seems graver than ever. But its not like it ever went away, even after the fall of the Soviet Union. In fact, as legendary Pentagon Papers whistle-blower Daniel Ellsberg writes in his explosive new book The Doomsday Machine, every president since Truman has prepared for nuclear war on a hair trigger basis. He knows, because he was the high-level defense analyst who wrote the plans for nuclear war in the 1960’s. In fact, he had planned to reveal those plans after releasing the Pentagon Papers, but the copies he had made of first hand source material got lost in a freak accident. In the decades since, the original documents have been declassified, and he now reveals it all in his shocking firsthand account of America’s nuclear program. 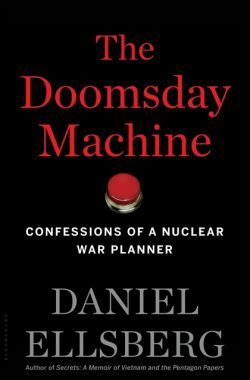 The Doomsday Machine is a “chronicle of human madness”, as Ellsberg calls it, that now has become even more salient with a reckless president in charge of our nuclear arsenal. The Trump administration announced its new nuclear policy this week — and it’s terrifying. It calls for increasing the role of nuclear weapons in US foreign policy strategy, along with a 1.2 trillion investment in new nuclear weapons. Some of those would make it far easier to start a nuclear war than ever before. Hampshire college peace and security studies professor Michael Klare says Trump’s nuclear policy will only increase the risk of confrontation with the other nuclear powers, including Russia and China. Read his Nation article Trump’s Nuclear Posture Review: Back to Armageddon. Michael Klare is the author of numerous books, including Rising Powers, Shrinking Planet, which he spoke about with Writer’s Voice in 2008. Thanks for interviewing Daniel Ellsberg. He’s one of my heroes, and his new book addresses a theme that has troubled me since I was nine. I doubt that sanity will prevail, but I hope that in the future more enlightened leaders will find a way to unite the world in the mission of abolishing nuclear weapons. Unfortunately, I fear that only an accident with catastrophic loss of life will convince the world to finally put an end to this sword of Damacles.